The following is an excerpt from Maximum Sunlight, a book of reportage by writer Meagan Day and photographer Hannah Klein, available now from Wolfman Editions. The edges of Tonopah are sharp. There are houses and trailers with yards full of trampolines and car parts, and then suddenly there is only earth and sky. 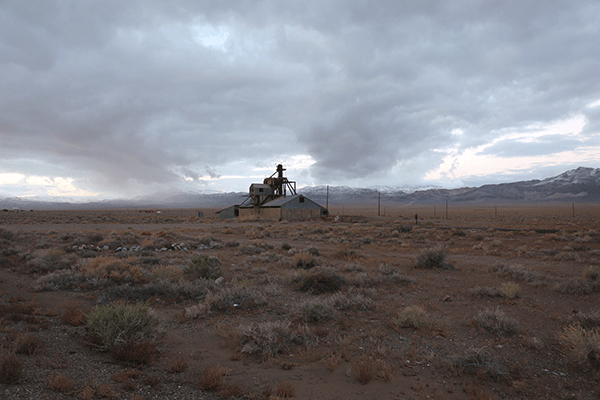 Tonopah, Nevada, is an island of civilization in a vast humanless sea. In the desert there is some confusion between up and down. After heavy rains, water pools between the blackbrush and mirrors the stratosphere. Just after sunset, the crisp horizon dissolves into a hazy bluish band. An inverted Fata Morgana will sometimes appear, actual mountains collapsing into an imaginary limit. Tough bald hills slope at impossible angles, as if molded under the heel of a giant. It’s easy to envision dinosaurs pounding this dry terrain with legs the size of refrigerators. In the centuries since the arrival of Europeans, Nevada’s Great Basin has inspired scores of esoteric origin theories. In 1924, an article about the research of archaeologist Alain Le Baron made the front page of the San Francisco Examiner with the title, “Was the Garden of Eden Located in Nevada?” Le Baron claimed to have found petroglyphs not far from Tonopah that resembled Egyptian and Chinese characters, but predated both. He called the petroglyph site the Hill of a Thousand Tombs, and believed it was evidence of an alternative anthropological timeline. His theory held that a prehistoric society called the Cascadian Race originated in Nevada and proceeded from there to populate the rest of the world. Earlier yet, in 1917, an amateur geologist named Albert E. Knapp claimed to have found a fossilized human footprint from the Triassic period ­– the imprint of a shoe made of stitched dinosaur hide. This led him to believe that humans and dinosaurs had coexisted in Nevada’s Great Basin two hundred million years ago. The New York Times took Knapp’s finding somewhat seriously, as did Nobel Prize-winning Oxford scientist Frederick Soddy, who used it to support his pet theory of a superior race of prehistoric humans that destroyed itself after achieving scientific mastery over atomic energy. In Soddy’s account, the sophisticated civilization made a technical mistake that wiped them out, leaving us—their more primitive counterparts—behind to literally reinvent the wheel. These theories share a design: desertion by superior progenitors, the Great Basin as the point of origin for a flourishing society that eventually evacuates the region. 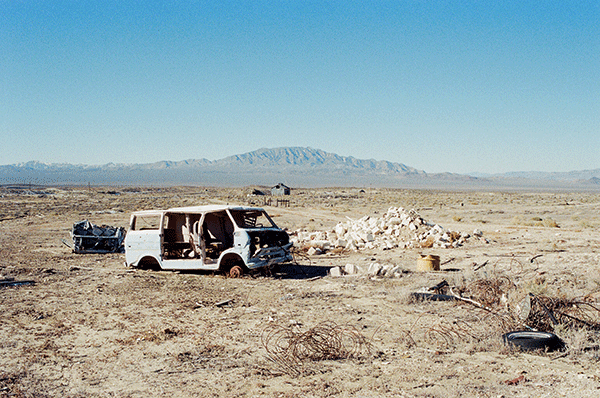 This motif of abandonment can be located, too, in less fringe mythologies of the Nevada desert. After all Nevada, like California, experienced a Gold Rush boom that produced enormous wealth in the late 19th and early 20th centuries. Tonopah was known as a place where millionaires were minted. But the money made in Nevada boomtowns was soon taken elsewhere, mainly to California or back East in the pockets of savvy capitalists. Briefly, many of these towns were opulent. Now they are the residue of imperial advancement. Decade by decade their elegance fades. She’s playing electronic keno, a game that has a reputation as a working-class diversion – it was once considered too blue-collar, even, for gambling houses on the Las Vegas strip. All around us colorful lights flash on gaming screens. The décor in the Tonopah Station is Western-fantasy, all wagon wheels and old saloon signage and antique tonic tins. 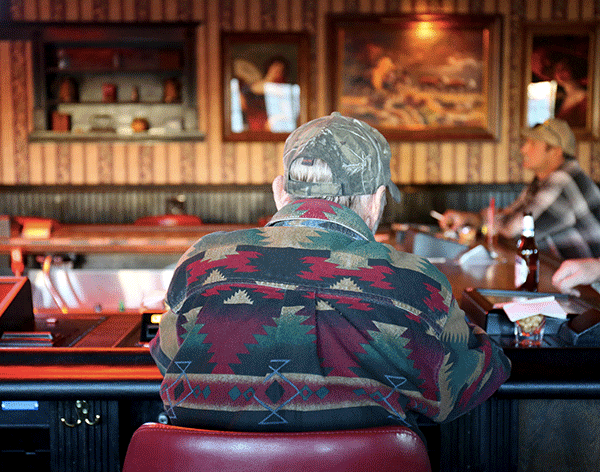 The soundtrack is contemporary country, punctuated by bleeps from the gaming machines. The bar adjacent to the gaming room is doing decent business though it’s only one in the afternoon. The first time I passed through Tonopah, I lost an hour wandering its complicated streets, wide-eyed and straining with curiosity. 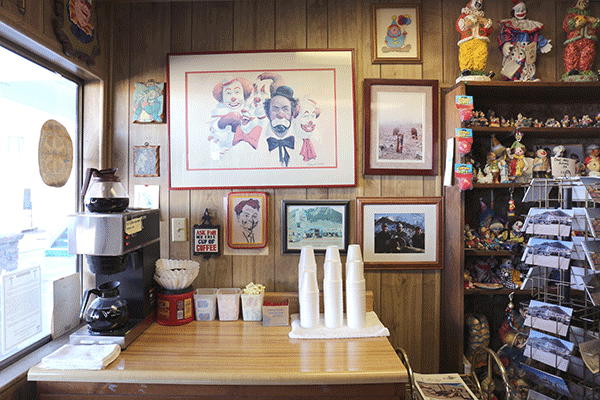 I was especially transfixed by the Clown Motel, a pair of shabby two-story blue buildings at the edge of town. A plywood cutout in the shape of a clown points to a hand-painted sign announcing that truckers are welcome. Directly adjacent to the motel is a Gold Rush-era graveyard, a few paces from the parking lot. I stared at the motel in amazement thinking Why does this exist? Who the hell lives here, works here? I had no frame of reference. The route between Reno and Vegas is five hundred miles of America with essentially zero cultural profile. That’s roughly the distance between Boston and Washington D.C., a stretch that encompasses hundreds of hyper-distinct cultural enclaves. Even rural Nevadans themselves, like Linda at the casino, will admit that they are neither contradictions to nor embodiments of any particular social archetype. The nation draws a blank on rural Nevada. Rural Texans have the stalwart cowboy, Iowans have the forthright yeoman, and Mainers have the hard-bitten seafarer with rubber boots up to his knees. Nevadans have the counter-eater. Evidently I am not the first to grasp at straws. In recent years, perhaps libertarian icon Cliven Bundy’s high-profile standoff with the federal government has replaced the counter-eater of yore with the modern right-wing libertarian weapons stockpiler. But that still doesn’t explain what a clown-themed motel is doing next to a graveyard in the middle of the treeless wilderness. “What do you mean by that?” I ask her. She’s probably in her early fifties but has girlish face and round, earnest eyes. Her waist-length red hair is bound by a scrunchy at the nape of her neck. When she speaks, each r sound shades slightly into a w.
Behind me are two life-sized clown dummies. One is an early iteration of Ronald McDonald, while the other is more of a Barnum & Bailey type. The Clown Motel sits at the western edge of town. For the phobic, there’s no skirting the issue—there’s a clown on every door and clown paintings above every bed. Adding to the potential fear factor is the cemetery right next to the motel, visible from nearly every vantage point. “Are people freaked out by this place?” I ask. The smaller clown figurines are cheerful portrayals with oversized shoes, accordions and juggling pins—vestiges of a time when clowns enjoyed more favor in the hearts of the masses. The whole history of clowns is on display: there are porcelain harlequins with cherubic faces and rosy cheeks, hobo clowns with patches on their pants and sympathetic frowns, and polka-dotted buffoons with frizzy orange hair poking out above their ears. “Oh sure, people are scared,” she answers. “But we still get a lot of business. Some people actually come here to face their fear. I’ve seen ‘em faint and I’ve seen ‘em scream. It’s not uncommon to see somebody walk in and their face turn pure white.” She tells me she’s even met people who were sent here on the advice of their therapists. “What’s a sensitive?” I ask. “Is this a violent place?” I ask. Night is falling and my car is parked closer to the center of town, so I’ll need to walk. In the 1980s, Lockheed started building the F-117 Nighthawk at the Tonopah Test Range, also known as Area 52. It was America’s first stealth aircraft, designed to avoid radar detection in enemy airspace. The engineering of the F-117 was a highly classified black project and the Tonopah Test Range a black site. For years, thousands of personnel were flown to Tonopah on Mondays and back out to the Las Vegas area on Fridays. They slept in a dormitory called Mancamp, and were prohibited from telling their families where precisely they went all week. The F-117 flew only in the dark, and its manuals were kept inside a hyper-secure vault. The pilots were called Bandits, and wore patches featuring scorpions, sphinxes, atomic symbols, grim reapers and eagles with lightning emanating from their talons. One patch featured an image of the plane and the embroidered words, “To those who hide at night, beware of those in the shadows.” Eventually, the Nighthawk was ready for war. In 1991, leaflets rained down on Iraqi villages showing the plane wreaking havoc. “Escape now and save yourselves,” the leaflets read. 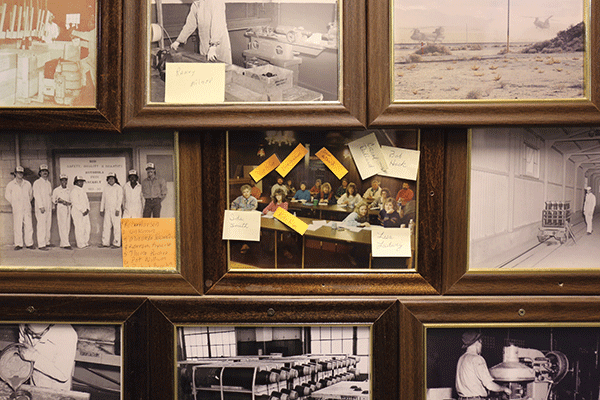 While Tonopah’s Area 52 is not as ubiquitous in conspiracy theories as neighboring Area 51, the site’s combination of strict confidentiality and global impact lends itself to paranoid interpretations. Most residents know bits and pieces of what takes place in the desert outside their town, but nobody knows everything. Parts of the history are still classified, and secret projects are still underway. “Do a lot of people believe in UFOs around here?” I ask Wilma at the Clown Motel. “Why do you think people see so many UFOs here in this part of the country?” I ask. I suspect that Wilma would believe in UFOs whether or not she lived near a secret government site. Throughout our conversation, she eagerly divulges theories about additional forms of paranormal activity (while she has not seen a ghost at the Clown, she has smelled one ­­– it wafted in on a cold wind and “smelled like a very ancient perfume”). Other residents surprise me a bit more, like Clifford who works at the town bookshop. He gets excited when I mention the Tonopah Test Range and the stealth bomber built there. “Oh man, it’s an awesome piece of war machinery,” he says. “It’s a killing machine. The designers were all told to design different parts – the wings, the cockpit. There was no collaboration whatsoever. That’s how they keep the secrecy of the design.” He relishes both the technical sophistication and the cloak-and-dagger gravity of the project. “Somebody told me they’re building another secret plane out there,” I offer. I never learn his name, and I never find the golf balls. All photographs copyright Hannah Klein.